With 20 years of experience in ballot initiatives, public affairs, public relations & marketing, our team is changing the way we speak to voters and opinion leaders. Wilson Public Affairs is a full-service public affairs firm specializing in issue advocacy and political campaign management for clients throughout California and across the country. We integrate public relations, communications and political outreach methods to create innovative campaigns that achieve results. Christy Wilson is a highly trusted and respected campaign manager, with nearly 20 years of experience in ballot initiatives, public affairs, public relations and marketing. Christy has managed and implemented campaigns on a broad range of issues including frivolous lawsuits, insurance reform, mortgage and financial bailouts, energy, gaming, campaign finance, taxation and education. Her expertise lies in developing and organizing ballot initiative and legislative advocacy campaigns. From the conceptual phase through the drafting, qualification and campaign phases of these efforts, Christy excels at aligning the interests of her clients with public opinion in order to achieve their policy goals. As a campaign manager, she manages all aspects of public opinion research, strategic planning, media relations, marketing, grassroots and grasstops coalition building, speakers training, paid media and legislative advocacy. Her work has garnered Pollie, Tellie and Summit Creative Awards. Her clients have included the Personal Insurance Federation of California, California Chamber of Commerce, Bio, State Farm Mutual Insurance Company, BD, Valero, Chevron, California Restaurant Association, Solano County Water Agency, among others. Before starting her own public affairs practice, she was a partner with Goddard Claussen/West. She received her B.A. in International Relations from Tulane University. Jennifer Singer has extensive marketing and communications experience with expertise in social media and content strategy used to drive awareness and engagement with target audiences. As account manager, she is responsible for the day-to-day management of the firm’s activities ensuring the clients’ objectives are met. Before joining Wilson Public Affairs, Jennifer worked in the destination marketing field for five years. She previously worked on the successful Proposition 20, 24 and 29 ballot initiative campaigns among many other high-profile California issue-advocacy programs. She received her B.A. in Government from California State University, Sacramento. She is a travel, food and wine enthusiast. 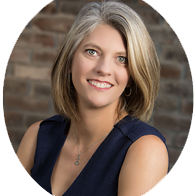 Julie Roberts helps execute public affairs projects and political solutions for trade associations, fortune 500 companies and issue advocacy clients across a variety of industries such as energy, insurance and water. 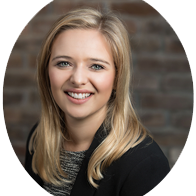 She executes strategic digital and social media campaigns creating tailored approaches to meet the needs of the firm’s clients. Julie also has extensive experience managing local outreach activities including coalition building, stakeholder education and earned media. 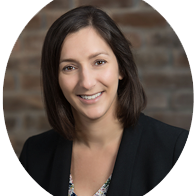 Before joining Wilson Public Affairs, Julie worked for a member of the Board of Equalization executing outreach strategies and social media activities alongside the Communications Director. Julie received her B.A. in Communication with minors in English and Sociology from the University of California, Davis. She is a skier, reader and cycling instructor. While past victories provide insights, at Wilson Public Affairs you never get an outdated, one-size-fits-all approach. We develop innovative, cost-effective and impactful campaigns to achieve our clients' desired results. Public policy decisions can have a dramatic impact on industries, organizations and individuals. Sometimes the stakes are survival itself. A few well-connected lobbyists can no longer win emotional legislative battles alone. We’ve created and executed integrated campaigns using media relations, coalition building, grassroots mobilization and targeting advertising to complement direct lobbying and win some of the most important issue battles of our time. We’ve mastered the art of intersecting our clients’ interests with the self-interests of their audiences. That’s the power behind our winning record on some of the most important campaign issues in the country, including insurance, health care, tort reform, taxation, education and environmental regulation. It is not enough to simply be right on an issue. We tell your story so that the public, opinion leaders and decision makers understand (and are sympathetic to) your issues. Your issues must be framed and targeted properly to ensure that the right messengers are delivering the right messages to the right audiences. We can help achieve just that by working with our clients on corporate reputation plans and programs, situational analysis and risk assessment, media training, talking points, press releases, op-eds and letters to the editor. Defining issues in the media is often essential to winning with voters and the legislature. We work with our clients to generate editorials, place articles and run news bureaus, harnessing a solid network of personal relationships with key reporters and editorial writers to deliver winning messages for our clients. We also recognize the importance of promoting our messages through the blogosphere. Reaching out to bloggers, providing on-line responses to blog postings when appropriate, and facilitating third party blog postings and responses are all significant components of an effective earned media program. A strong legislative public affairs strategy requires a government relations program to ensure our clients’ issues are effectively communicated to policymakers, stakeholders and constituents. We create and execute integrated campaigns using coalition building, media relations, and grassroots and grasstops mobilization to complement direct lobbying. We have the knowledge and experience to protect our client’s reputation should they face unexpected public challenges. Our team is skilled in helping organizations achieve stability in a time of crisis by streamlining communications processes, rapid-response capability and thorough message development effectively, professionally and with the highest level of integrity. A successful campaign is driven by good research to ensure your messaging resonates with your target audience. We have the ability to conduct qualitative and quantitative research, including issue research, public opinion research and opposition research. We know when to use digital resources and when to talk to people face-to-face to better understand an issue. We have the capability to analyze research and then turn that research into credible, polished, viable messages that become the framework for every effort we undertake. Anyone can add to the message clutter. The trick is creating advertising that doesn’t just go in one ear and out the other, but spends some quality time in between. In today’s fast paced world, audiences rely on social media outlets for a variety of information. It is important to have a team that understands the significant influence these communication tools can have in a campaign and knows how to leverage them effectively and appropriately for our clients’ issues. 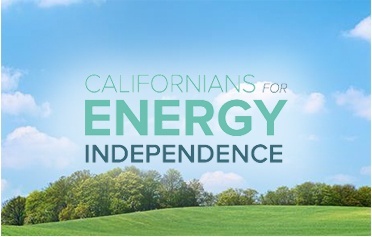 Wilson Public Affairs managed Californians for Energy Independence (CEI), a coalition of Californian voters in support of California’s oil and gas industry. As part of this effort, WPA developed and executed the strategies necessary to effectively position the industry on hydraulic fracturing and other energy production methods at the statewide and local levels including fighting ordinances and ballot initiatives that would shut down oil and gas production throughout the state. As the strategic lead for this project, our team oversaw earned media, coalition building, research, opposition monitoring, direct mail, local activation and strategy, paid media, including a robust digital and social media campaign, and voter file maintenance and targeting. 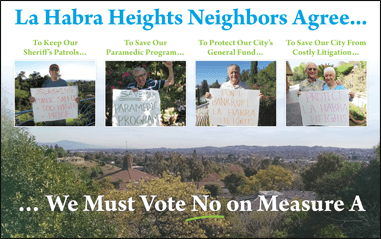 Under the CEI umbrella, we successfully defeated Measure P on the 2014 Santa Barbara ballot and Measure A on the 2015 La Habra Heights ballot, as well as numerous ordinances across the state. We also grew the coalition to more than 250,000 Californians in support of our efforts, with more than 140,000 Facebook likes and 16,000 Twitter followers. Proposition 29 in 2012 started with a seemingly unbeatable 67% support for a tobacco tax and seemed destined for voter approval. Using a robust public opinion and targeting program, we were able to develop and microtarget the right messages to the right audiences for message resonation. While reinforcing the acknowledgment of support for cancer research, we isolated and then focused on a number of flaws in the measure, including a loophole that would allow tax revenues to be sent out of state, increased bureaucracy and a problematic ballot box budgeting structure. This strategy – focusing on issues other than the tobacco tax itself – ultimately led to one of the largest shifts in public opinion on an issue in recent California campaign history, with voters rejecting Prop. 29 with a 50.2% vote. While the campaign won by a razor thin margin, this victory represents a 45-percentage point move in our favor. In late 2014, a coalition of local homeowners qualified a fracking ban for the March 2015 ballot in La Habra Heights, a small community outside Los Angeles. 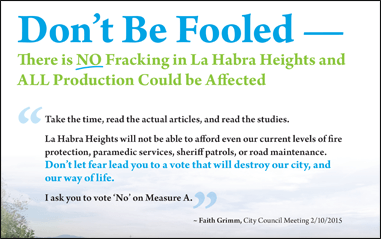 A vocal minority, these homeowners were relentless in their opposition to fracking – despite the fact that there is no fracking occurring in La Habra Heights. We developed a highly personalized campaign plan that ensured we touched all 1,750 voting households in La Habra Heights with some form of voter contact every week through the election. Our robust grassroots advocacy plan included field operations, grassroots and grasstops coalition engagement and direct mail. We also developed a three-month walk program that ensured we had knocked on every door in the community three times before Election Day. This election had the highest primary election voter turnout in city history, with 49.4% of residents voting on the issue. Measure A was defeated by a 14-point margin, with 57% of voters against the ban and 43% of voters in support. In March 2010, a coalition of high tech, bio tech and entertainment industries opposed an initiative filed by the teacher’s union to repeal job-creating tax reforms passed the previous year. Backers of Prop. 24 focused their campaign on blaming “greedy” corporations and Wall Street for the pain people were feeling on Main Street, and positioned Prop. 24 as a “painless” way for schools to get back money they claimed was unfairly given to wealthy corporations. Public opinion research indicated that in order to counter their arguments successfully, we needed to define Prop. 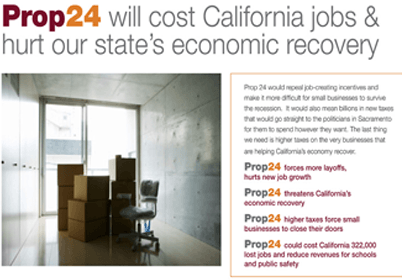 24 by its impact on jobs and small businesses. Our Stop the Jobs Tax Committee raised concerns that Prop. 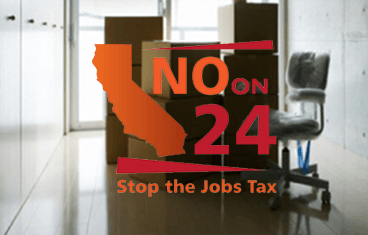 24’s “jobs tax” would not be a painless way to increase funds for education and other services, but rather a measure that would stall economic recovery and lead to fewer jobs and long-term revenues. The “No on 24” campaign actively recruited coalition members and created an interactive Google map that demonstrated the wide range of opposition from throughout California. Over 200 small businesses were highlighted. 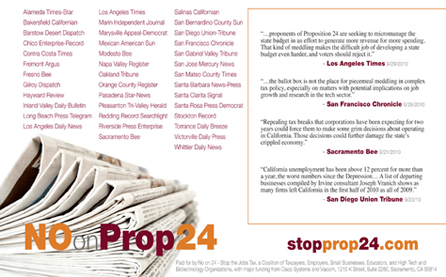 We also secured a “No on 24” endorsement from every major newspaper in the state. On Election Day, Prop. 24 was defeated by a vote of 58% no to 42% yes. In February 2007, the Minnesota Trial Lawyers Association (MTLA) backed legislation that would allow two lawsuits for every insurance accident, one against the person who caused the accident and another against his or her insurance company. 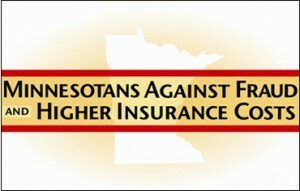 Minnesotans Against Fraud and Higher Insurance Costs was created in response to this legislation. The committee launched its attack through paid and earned media, direct mail and grassroots and grasstops recruitment. Our campaign messaging strategy framed the issue in a way that consumers would understand and provided enough fuel to encourage public outcry. The legislation was branded the “Double Lawsuit” Bill. Our coalition and messaging provided substantial hurdles at every step of the legislative process that the MTLA was unable to overcome. Attempts to include it in the budget language were unsuccessful and the stand alone language was never brought up for a vote because the trial bar did not have the votes to get it passed. Originally intended to help district attorneys stop illegal merchandising, California’s Unfair Competition Law (UCL) became increasingly abused by private lawyers bringing suits without a client or evidence of harm. In late 2002, the abuses of the UCL started making headlines when one law firm filed lawsuits against thousands of small business owners. This environment provided the business community its best hope of closing the abusive shakedown loophole. The campaign was highly effective from start to finish. The initial research phase produced a tightly crafted measure that yielded real reform but was still comprehensible to voters. Despite the legal language used in the title/summary and the clutter of 15 other issues on the ballot, Prop. 64 achieved message dominance and maintained message discipline throughout the effort due to aggressive paid and earned media campaigns. 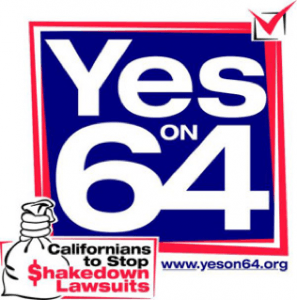 Trial lawyers attempted to hide behind so-called “environmental” groups in their opposition campaign, claiming that enactment of Proposition 64 would “gut” enforcement of California’s environmental laws. Despite a $4 million campaign funded by trial lawyers, California voters saw through this smokescreen. In a stunning victory for tort reform supporters and an equally stunning defeat for the trial bar, Proposition 64 passed with a 59% yes to 41% no vote. To contact us by phone please call (916) 520-2412.